Payments made to WristClocks.com are only accepted in U.S. dollars. The accuracy of the exchange rates listed above cannot be guaranteed. To ensure that you have the most up-to-date information, please confirm the current exchange rates before making any transactions that might be affected. Foreign currency rates can be found at Yahoo! Finance. Rates may vary for actual transactions, and WristClocks.com does not guarantee that it will enter into any transaction at any rate displayed. All measurements provided are approximate and may vary slightly from the listed information. 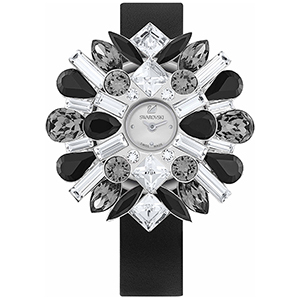 The Swarovski by Shourouk Stainless Steel Quartz Womens Watch Model # 5095571 is the first watch that has been made in collaboration with the French designer Shourouk. This versatile watch is available with one stainless steel cover and two crystal-embellished covers. Also, the watch comes with 3 leather straps: 1 black calfskin, 1 black patent and 1 silver, which allow up to nine attractive combinations. The dial of this timepiece has a silver-tone finish with the Swarovski Swan logo. With 30 meters/100 feet water-resistance, you can wear the watch even in the rain. The uniquely designed watch works on Quartz movement, giving optimal accuracy in time keeping. Like all of our watches, this Swarovski by Shourouk Stainless Steel Quartz Womens Watch is Brand New, and comes in its original packaging! The Swarovski watches are embedded with signature faceted crystals to create a completely new form of contemporary designs. With a vision to make crystals accessible to a wider consumer base, Swarovski was founded in 1895 by Daniel Swarovski in a small town called Wattens, located in the Austrian Alps. A Bohemian jeweler by profession, Daniel Swarovski got an electric crystal cutting machine patented in his name. The machine helped increase Swarovski’s production potential and opened up his mind to new cutting styles and designs, catapulting him to global recognition wherein, the crystals were worn by the likes of Marilyn Monroe in the movie ‘Gentlemen Prefer Blondes’ and many other pop culture icons. Even after Swarovski’s death, the company’s vision and drive for creating something new has not faded away. The crystal watches and all the other ventures they have taken up have made Swarovski a global leader and an icon in fashion culture.